Your New UpChefs Sandwich Cutter Set Makes Mealtime Super Fun! Your little girl will be eager and excited to see what shapes will be on her plate, or in her lunch box. That means you'll be able to feed your daughter a healthy diet rich in fruits, vegetables, and whole grain breads -- WITHOUT begging, pleading, and meltdowns at mealtime. Even better, you can grab your UpChefs Sandwich Cutter Set today at NO RISK thanks to your solid gold 100% Satisfaction Money-Back Lifetime Guarantee. Go ahead and order your UpChefs Sandwich Cutter Set now. Try it out in the comfort of your own kitchen. We think you'll be delighted at how easy it is to use, and how much fun you and your family with have with it. But, if for some reason, you're not absolutely thrilled with your UpChefs Sandwich Cutter Set, let us know and we'll refund every penny you paid. You don't risk a thing because we take on all the risk for you. Then go ahead and click the yellow "Add to Cart" button above now to get your own UpChefs Sandwich Cutter Set rushed to your front door while we still have some in stock. ✅ WHIP UP FUN SCHOOL LUNCHES: Your UpChefs cute princess crown, butterfly, dolphin, or heart shaped sandwich cutter is the perfect way to make fun, healthy school lunches your little princess will love to eat and show off to her friends! ✅ ALL-IN-ONE SANDWICH CUTTER SET: Your UpChefs variety pack sandwich bread cutter and sealer kit gives the tools and supplies you need to cut quick and easy sandwiches. 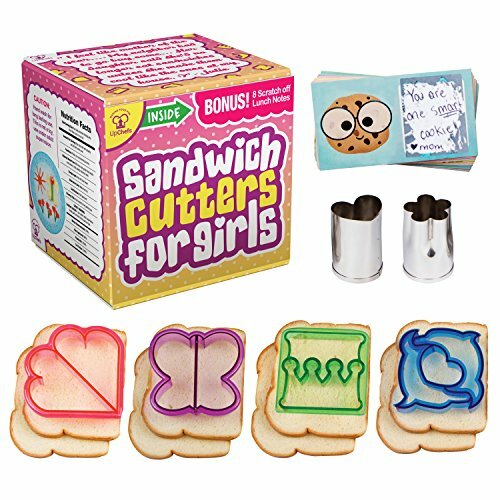 You'll get 4 BPA free sandwich cutter crust remover, 2 mini size heart and flower veggie cutters, and 8 scratch-off notes and stickers. ✅ DISHWASHER SAFE: We've fashioned your UpChefs sandwich cookie cutters set from eco-friendly BPA-free plastic and stainless steel. That means they're safe, durable, and a cinch to clean. Just rinse them off after use and toss them in the top rack of your dishwasher. All done! ✅ ORDER TODAY AND RECEIVE A FREE GIFT: You'll receive 8 scratch-off notes and stickers as a free gift when you order your UpChefs sandwich cutters for children. These scratch-off stickers are so much fun. Include one in your daughter's lunchbox for an unforgettable lunchtime surprise! ✅100% SATISFACTION G UARANTEED: We're confident you'll love your new UpChefs Sandwich Cutter Set. But, if you're dissatisfied for any reason (or none at all) let us know and we'll cheerfully refund every penny of your purchase. If you have any questions about this product by UpChefs, contact us by completing and submitting the form below. If you are looking for a specif part number, please include it with your message. Number & Letter fondant cutters by CiE - 35 Pcs, Mini alphabet and number cookie cutter set. Includes storage boxes and recipe.